A significant figure in the history of Italian literature, Giovanni Boccaccio was among the founders of the Renaissance. In spite of studying law and business for years, Boccaccio’s interest naturally lied in poetry and writing. His greatest work Decameron has claimed fame for over 600 years and has caste an influence on other writers for instance Francesco Petrarch who translated Decameron into Latin. Besides being a writer, Giovanni was also a humanist and sometimes accredited to as the founder of Humanism. Giovanni Boccaccio was born in the year 1313 in Italy. The exact date and place of his birth is uncertain. However, it is known that he spent his childhood in Florence. His father was a prominent merchant and his mother also belonged to an illustrious family. Giovanni attended school in Florence and was taken into business at the age of 10. He was sent to Naples to study business and law in 1327. His growing interest in literature drifted him away from studying these subjects. He eventually gave up on studying and entirely dedicated himself to literature. He fell in love with a lady and named her Fiammetta in his writings. During this time Giovanni also started mingling with the courtly society. He returned to Florence in 1348 at the death of his father and became guardian to his younger brother. Giovanni was trusted with public offices in Florence and also sent on diplomatic missions to Padua, the Romagna, Avignon and elsewhere. Boccaccio’s lifelong friendship with Petrarch began in 1350. Both writers often worked closely with each other. 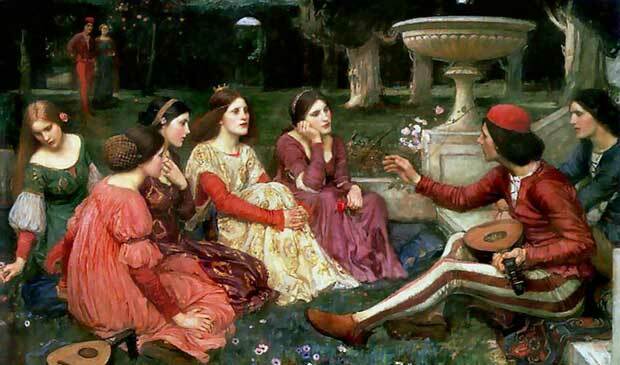 Boccaccio completed the great Decameron in 1358 which narrates hundred stories of seven women and three men who reside in a country villa for ten days after escaping from the plague in Florence. Decameorn has influenced Europe for the longest time and great writers such as Shakespeare and Chaucer are known to have borrowed from this masterpiece. Also renowned poets such as George Eliot, Tennyson, Keats, Longfellow and Swinburne have written poems revolving around the Decameron. Giovanni on the other hand was impressed by the works of Dante and conducted lectures on his poems in 1373. Boccaccio produced an excellent piece of work on classical mythology tilted On the Genealogy of the Gods of the Gentiles (De genealogia deorum gentilium) (1350-1374), written in Latin, this composition focused on classical mythology and culture. From 1354 to 1355, Boccaccio worked on writing about the problems of one sided love, The Corbaccio (Il Corbaccio). Boccaccio’s admiration for Dante compelled him to write the Biography of Dante (1355-1364). Another well known effort is On the Fates of Famous Men (De casibus virorum illustrium) (1355-1374) which describes the downfall of influential men. He also composed a noteworthy volume on biographies of famous women, Concerning Famous Women (De claris mulieribus) (1360-1374). Disappointing love affairs and deteriorating health made Giovanni depressive and his writing started showing signs of bitterness especially towards women. He attempted to burn and sell his work, letters, manuscripts and library. Petrarch convinced him not to burn his belonging and offered to purchase them from him. However, after his death, Boccaccio’s literary belongings were presented to the monastery of Santo Spirito, in Florence. Although never married, Boccaccio was a father to three children. He passed away on December 21, 1375.